Schedule Appointments From Our Web Site! 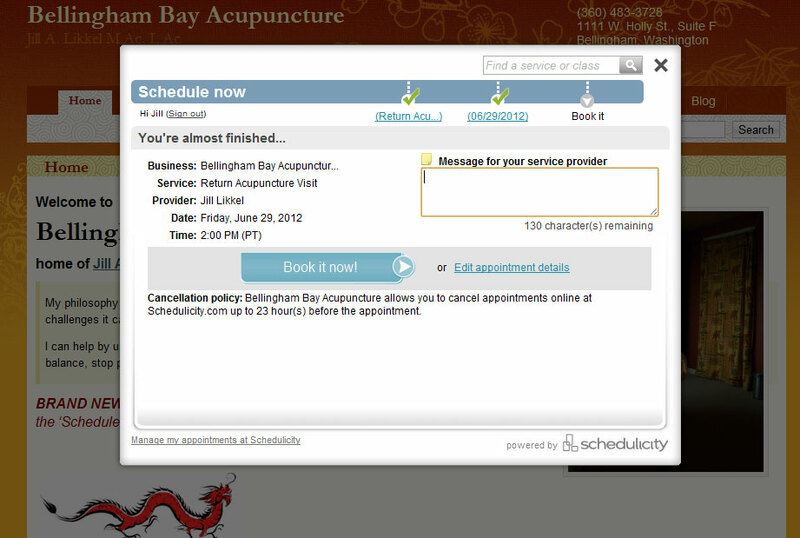 I’m excited to report that we’ve recently given all of our patients the ability to manage your own appointments online! 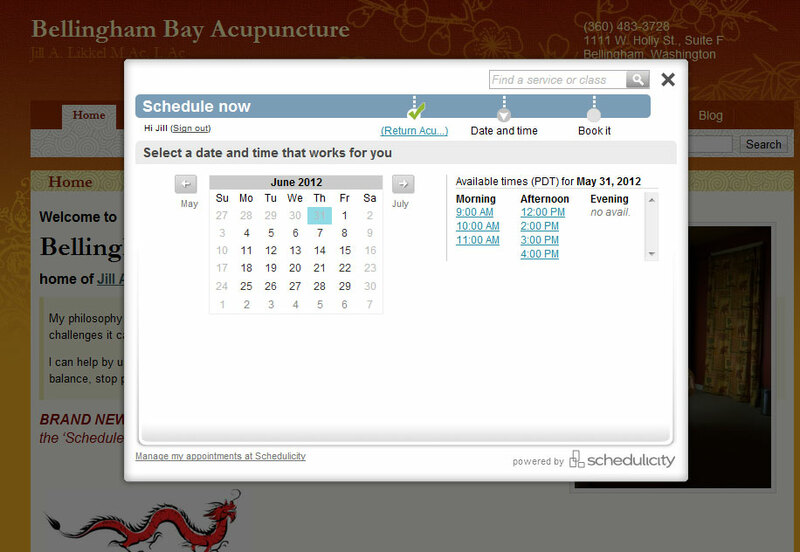 Patients can now schedule appointments directly from my bellinghambayacupuncture.com, and also from my Facebook page. Today I’ll walk you through scheduling from my web site – and I’ll do a followup post on how to schedule from Facebook soon. Please contact me if you run into any questions! So far, many of my patients have already been benefiting from this feature. Our goal is to make your experience as smooth as possible, so please don’t hesitate to let me know what you think! Step 2: Choose the type of appointment you’d like to schedule. If you’re not sure, choose ‘Return Acupuncture Visit’. Step 3: Choose an available (i.e. non-greyed-out) day to schedule your appointment. Note that you can press right and left arrows to change the month you’re currently viewing. Step 4: Once you’ve clicked on an available date, you’ll see that all open times for that day appear on the right side of the screen. Click on the time of your choice. Step 5: Confirm your appointment. 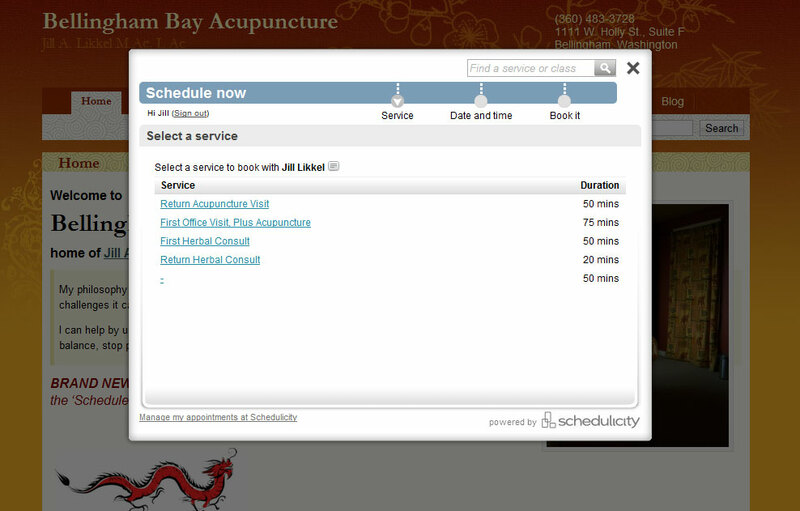 If you’d like to include a personal note to me (Jill Likkel, acupuncturist), please feel free to write a note here before you confirm your appointment. Please be aware that anything you write in this step will not be 100% secure; it’s intended for messages that are not highly sensitive. That’s it! You will immediately receive a confirmation email, and another email reminder the day prior to your appointment. Please remember that you are more than welcome to continue using my phone service to make your appointments. They can be reached at (360) 483-3728. Imagine not being able to go to school or work or even leave the house for five days or more a month. Imagine feeling ashamed of soiling your clothes and being humiliated or exploited by others for the lack of feminine hygiene. This is why I am holding another fundraiser for the nonprofit 100% volunteer organization Days For Girls International. They provide washable reusable kits that have what a girl would need to get her through the five days or more of her menstrual period. One of these kits could last for several years. Volunteer sewers and assemblers from all over the world put the pieces together. Some make beautiful carrying bags, some make pads and some provide soap, wash cloths and assemble the kits to ship off all over the planet. They help train others to make kits and try to do everything in a sustainable way. Please go to their website at www.daysforgirls.org to learn more about what they do. So back to the fundraiser. This Saturday April 14th from 12-4 pm, I am having a community acupuncture fundraiser for Days For Girls. This will be community style acupuncture in chairs using acupuncture points on the lower legs, arms and ears. No appointments necessary just come on in and have a seat. 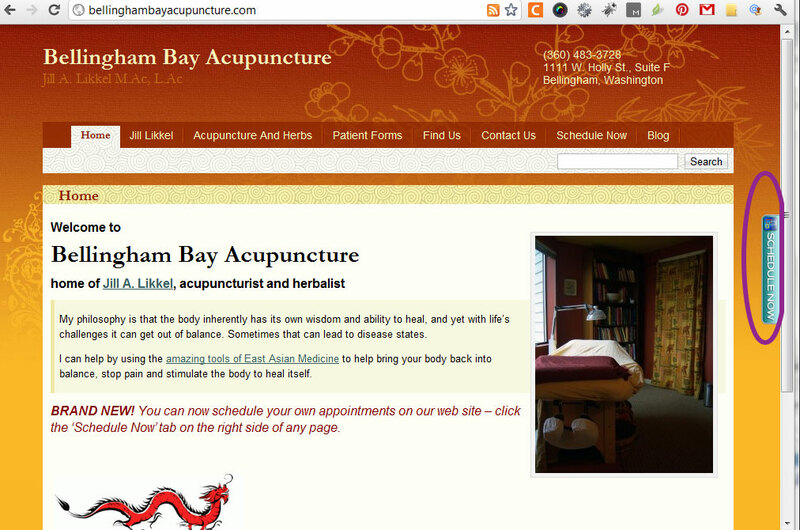 If you have never been to acupuncture before, no worries, it will be very gentle and relaxing. I am asking a minimum donation of $10 but you can certainly bring more and I won’t check to see what you bring. 100% of the donations will go to Days For Girls. Just show up and bring lots of friends, I want to be very busy! If you are worried about needles, I have some very attractive gold-plated beads I can put on some acupuncture points in your outer ear. You can wear them for up to one week. The subject of Chinese herbs is so vast and I don’t believe any blog can give you anywhere close to complete information. This first blog is just an introduction to some common herbs that you may have heard about or seen in Asian grocery stores. A little disclaimer first: I wouldn’t want any of you to start taking herbs without talking to a qualified herbalist about your specific health issues and constitution. It is also important to note that most herbalists in the Asian tradition will give you a formula instead of single herbs. The formulas are designed to correct imbalances in health that show up for various reasons while modifying the formula to negate any side effects. Mostly we don’t recommend you take this or that herb singly because you heard it was “good for your health”. Some herbs are more like food and can be cooked in food or made as a tea. Food can heat or cool down your body depending on the properties contained within so it is important to be aware of your internal climate before putting something in your mouth. You may love chiles for instance, but if you are always hot and uncomfortable in the heat, they may not be the best thing for you at this time. Just like food, herbs also have a temperature and a flavor along with specific properties that make it easier to match the herbs with a condition and a constitution. Let us start with ginseng and some of the tonic herbs which you may have heard about. Ginseng is an herb that is known as an adaptogen and is supposed to be good for many conditions. In Chinese medicine we are more conservative. We believe that you match the herb or the formula to what is going on in that person at the time of treatment. There are three common types of ginseng all with different temperatures and used for completely different conditions. Contraindications: Viral or bacterial infection (same for most herbs considered tonics). Builds up the immune system but once again don’t use it if you have a virus or bacteria. Huang qi is good for low energy and it helps regulate water balance in the body.